"[In 1860, the] cotton manufacturers and merchants [of Manchester, England] had reason to be smug: They stood at the center of a world-spanning empire -- the empire of cotton. They ruled over factories in which tens of thousands of workers operated huge spinning machines and noisy power looms. They acquired cotton from the slave plantations of the Americas and sold the products of their mills to markets in the most distant corners of the world. The cotton men debated the affairs of the world with surprising noncha­lance, even though their own occupations were almost banal -- making and hawking cotton thread and cloth. They owned noisy, dirty, crowded, and decidedly unrefined factories; they lived in cities black with soot from coal-fueled steam engines; they breathed the stench of human sweat and human waste. They ran an empire, but hardly seemed like emperors. 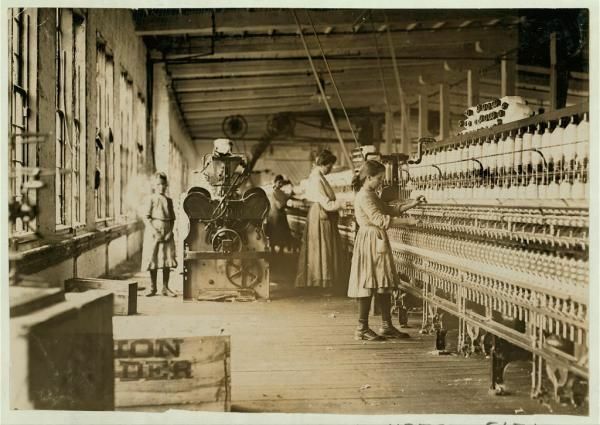 "Instead of women on low stools spinning on small wooden wheels in their cottages, or using a distaff and spinning bowl in front of their hut, in 1860 millions of mechanical spindles -- powered by steam engines and operated by wage workers, many of them children -- turned for up to fourteen hours a day, producing millions of pounds of yarn. Instead of householders growing cotton and turning it into homespun thread and hand-loomed cloth, millions of slaves labored on plantations in the Americas, thousands of miles away from the hungry factories they sup­plied, factories that in turn were thousands of miles removed from even­tual consumers of the cloth. Instead of caravans carrying West African cloth across the Sahara on camels, steamships plied the world's oceans, loaded with cotton from the American South or with British-made cot­ton fabrics. By 1860, the cotton capitalists who assembled to celebrate their accomplishments took as a fact of nature history's first globally inte­grated cotton manufacturing complex, even though the world they had helped create was of very recent vintage. "But in 1860, the future was nearly as unimaginable as the past. Manu­facturers and merchants alike would have scoffed if told how radically the world of cotton would change in the following century. By 1960, most raw cotton came again from Asia, China, the Soviet Union, and India, as did the bulk of cotton yarn and cloth. In Britain, as well as in the rest of Europe and New England, few cotton factories remained. The former centers of cotton manufacturing -- Manchester, Mulhouse, Barmen, and Lowell among them -- were littered with abandoned mills and haunted by unemployed workers. Indeed, in 1963 the Liverpool Cotton Associa­tion, once one of cotton's most important trade associations, sold its fur­niture at auction. The empire of cotton, at least the part dominated by Europe, had come crashing down."